Catharine Carroll Lees, viola, maintains an active career as recitalist, chamber musician, teacher and pedagogue. 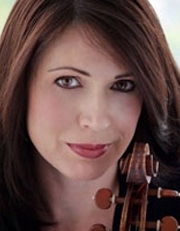 Professor of Viola at the University of Cincinnati College-Conservatory of Music where she also serves as Chairman of the String Department, Dr. Lees is a member of the Artist/Faculty of the Aspen Music Festival and School where she serves as Principal Violist of the Aspen Chamber Symphony. Dr. Lees has been featured as soloist with the Aspen Chamber Symphony, CCM Chamber Players, Wired, upcoming features include an appearance with CCM Philharmonia in Don Quixote. As a chamber musician she has collaborated with the world’s most prominent artists including Gil Shaham, Jaime Laredo, Sarah Chang, Nadja Solerno-Sonnenberg, Joey Swensen, as well as members of the Cleveland, American, LaSalle, Ariel Quartets, and Beaux Arts Trio and has been featured in broadcasts on WGUC, WFMT, NHK Radio, WOSU and NPR. Dr. Lees’ passion for teaching and the advancement of pedagogy led to her collaboration with Dorothy DeLay and Masao Kawasaki resulting in Essentials for Viola, a book on basic technique widely used by students who have claimed top prizes in international competitions as well as those who have won positions in major symphony orchestras and universities in the United States, Asia, and Europe. Other publications include A Comprehensive Overview of Left Hand Technique for Violin and Viola and a forthcoming release of a relaxation recording for performers combating performance anxiety. Dr. Lees has presented annual master classes at the Aspen Music Festival and School, and Universities including Eastman School of Music, University of Michigan, University of Texas at Austin, University of Memphis, Ohio State University and was featured at the 2014 ASTA (American String Teachers Association) Convention as well as at the 2011 International Viola Congress in Wurzburg, Germany. She hosted the 2010 International Viola Congress at CCM, featuring 75 violists in master classes, recitals, chamber music, lectures, and two orchestra gala concerts. Some of the highly renowned violists featured at the 2010 IVC at CCM were Nobuko Imai, Kim Kashkashian, Tabea Zimmermann, Bruno Guirrana, Garth Knox, Paul Coletti, Lawrence Dutton, Samuel Rhodes, James Dunham, David Aaron Carpenter among many others as well as artists including Gil Shaham, Adele Anthony, Akira Eguchi, Sandra Rivers, Eric Kim, Richie Hawley and more. Dr. Lees earned her Bachelor of Music, Master of Music and Doctorate of Musical Arts Degrees at CCM where she studied viola with Masao Kawasaki, violin with Henry Meyer, and chamber music with the LaSalle and Tokyo String Quartets. As a fellowship student of the Aspen Music Festival she received training in orchestral leadership with the concertmaster at that time of the Chicago Symphony Orchestra, Ruben Gonzales. You can learn more about Dr. Lees’ philosophy of teaching and student accomplishments by visiting her website at http://www.CatharineCarroll.com. BM, MM and DMA, CCM.